What's in a street name? It could be almost anything of historical or geographical importance. Newark even has several streets named for heroes of the Spanish-American War who fought in the Caribbean and others who gained glory in the Far East a century ago. Dewey Street is named for Admiral George Dewey, the American naval officer who served under Admiral David Farragut in the Civil War and in other positions in Europe before being assigned to the Asiatic squadron. When war broke out with Spain in 1898, he commanded the fleet that captured Manila in the face of overwhelming odds. With the assistance of Major General Wesley Merritt, Manila fell on August 13 and Dewey was given a special naval rank of admiral. Wainwright Street is named for Richard Wainwright, executive officer of the Battleship Maine, which was destroyed in Havana Harbor in 1898. During the war, the commander of the Gloucester helped in the defeat of the Spanish at Santiago de Cuba on July 3, 1898. Later he became superintendent of the Naval Academy. From 1900-02, he was commander of the USS Newark of the Great White Fleet. Schley Street honors Winfield Scott Schley, the hero of an 1884 Arctic rescue of Lt. Adolphus W. Greely. In the Spanish-American war, he helped destroy the fleet of Admiral Pascual Gervera as it was attempting to flee the harbor of Santiago de Cuba. Hobson Street is named for Richard Pearson Hobson of Greensboro, Alabama, who was educated in France and served in the Mediterranean and South America. He was best known for heroism in sinking the collier Merrimac at Cuba, thus blockading the exit and resulting in the destruction of the superior Spanish fleet. Later Hobson was to become one of the Navy's greatest exponents of American seapower. 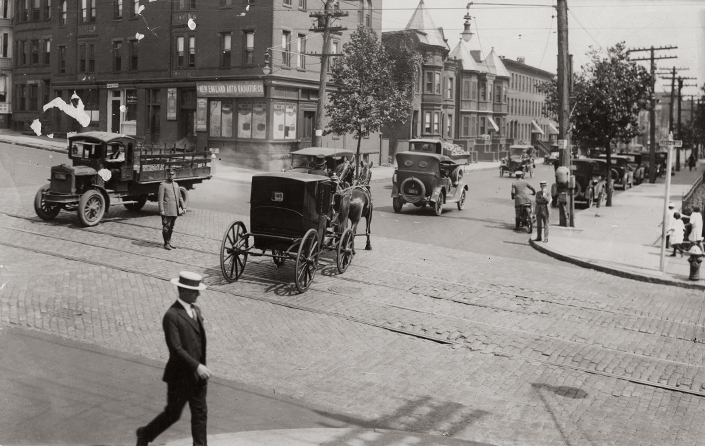 In spite of the influential position of the German community in Newark, an anti-German sentiment reigned after the outbreak of World War I. In Hoboken, feelings ran high, and the large German Lloyd Line and the Hamburg American Lines were seized by the federal government. In Newark, street names were changed by unanimous approval of the mayor and city commission. Anti-German feelings were also displayed in street parades. A famous World War I photograph shows Newark women war workers parading in front of city hall with an enormous sign in support of the war effort and a picture of the Kaiser on a nearby signpost painted in ridicule. The names of other streets changed at this time included Berlin to Rome Street, Dresden to London Street, Bremen to Mame Street, German to Belgium Street, Frankfort to Paris Street, and Frederick to Somme Street. The ordinance creating these changes was adopted on June 27, 1918, and signed by Mayor Charles P. Gillen and Commissioners Thomas Raymond, Alexander Archibald, William J. Brennan and John Monahan. Germans were not welcomed again at City Hall until the visit of the German ambassador midway between the two world wars. By that time normal relations had returned. Old animosities were forgotten.